General Mike Flynn’s inexplicable decision to plead guilty to lying to the FBI was disappointing to his many supporters in conservative national security circles. However, in one respect it was understandable; Flynn was being crushed by the legal bills required to defend himself against the relentless pursuit of Robert Mueller and his unlimited manpower and budget. Compared to the modest resources Flynn could muster from his military pension and his brief career as a consultant it was a steamroller vs a mongoose – and no matter how feisty the mongoose he would eventually be crushed. Pleading guilty to a questionable charge was the only way for General Flynn to get his life back. That and the fact that he was not afraid to tell the truth about Obama’s national security failures put a target on his back early on. Most laymen will not know that one of the constants in U.S. military affairs since the fall of the Soviet Union has been a military-to-military relationship with Russia. After 1991 the US spent billions of dollars through programs, such as the Department of Defense Cooperative Threat Reduction (CTR) Program, also known as the Nunn-Lugar Program, to help Russia secure its nuclear weapons complex, including a highly secret joint operation to remove weapons-grade uranium from unsecured storage depots in Kazakhstan. During the post-9/11 war in Afghanistan, Russia provided overflight rights for US cargo carriers and tankers, as well as access for the flow of weapons, ammunition, food and water to the US military. Russia’s military also provided intelligence on the Islamist sympathies of the Boston Marathon bombers, helped the US negotiate rights to use an airbase in Kyrgyzstan and allegedly provided intelligence on Osama bin Laden’s whereabouts. So how was General Flynn undermined so thoroughly that he lost the President’s confidence, resigned and eventually was forced to plead guilty to lying to the FBI? Hersh claims the alarm about the danger of Obama’s policies in Syria became so great that in the autumn of 2013 that high levels of the American military decided to take steps against the extremists without going through political channels, by providing US intelligence to the militaries of other nations, on the understanding that it would be passed on to the Syrian army and used against the common enemy, Jabhat al-Nusra and the Islamic State. The same John Brennan who admitted lying to Congress, who helped cover-up Benghazi and who has attacked relentlessly President Trump. This begs the question how did they know the substance of General Flynn’s calls with the Russians that eventually led to his downfall? Why the NSA intercepted General Flynn’s perfectly legal conversation with the Russian Ambassador remains a mystery, as does who authorized it, but absent a FISA Court order the intercept would be on its face illegal if Flynn was the target. Moreover, the release of the transcript to a media organization or to any unauthorized party is a serious felony and a violation of the compact by which citizens have granted the federal government the authority to monitor communications in the name of national security – yet none of those who committed this serious crime have been investigated or prosecuted. Flynn pushed out and "gone before anybody can see what happened" with these secret agreements, said a second insider close to Flynn and the White House. General Mike Flynn is a brilliant intelligence operator and a patriot. 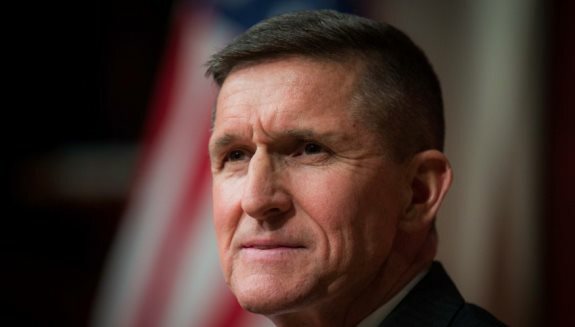 The saga of the political assassination of General Flynn is full of lessons about the power of the Obama deep state that Flynn was a part of, but of which he ultimately became a vociferous critic. Submitted by jon exner on Mon, 12/04/2017 - 12:00. From all that I can tell lawyer after lawyer including several Constitutional lawyers (professors) say that there was no law broken by anyone in the Trump transition team contacting any Russians which is not a crime to begin with. So this claim that Flynn lied is only partially correct, he lied that he did not contact a Russian, but the fact that he contacted the Russian which is not a crime Flynn essentially lied about doing something that is not a crime to begin with. Now everyone believes that Flynn will implicate Jarrod Kushner and say that he (Flynn) was instructed to contact the Russian which is not a crime to begin with by Kushner. Anyone see where this is going? Flynn lies about something that is not a crime and implicates Kushner by saying that Kushner told him to contact the Russian which is not a crime so where and how will Kushner be implicated by instructing Flynn to do something that is not a crime.